I am greatly blessed to have a teenage daughter who has remained a voracious reader, however we run into the problem of finding enough books for the girl to read. Amber adores historical fiction from almost any time period, but prefers her books to be a series where she can spend time with familiar characters. Every year I start a new quest for fiction books to supplement our history studies. Recently, we were given the fantastic opportunity to review a book of our choice from the six book Our America series by Susan Kilbride. This theme fits perfectly with our history study for the year and we were already a fan of Susan Kilbride's Science Unit Studies for Homeschoolers and Teachers. Amber chose to start with the very first book in the Our America series, The Pilgrim Adventure. For the purpose of the review I received the Kindle edition of The Pilgrim Adventure. It also is available as a paperback book from multiple book sellers. As a bonus, if you subscribe to Kindle Unlimited, this book is part of that service! The Our America series books are designed for children ages 10 through 13, however at age 13 Amber says she would definitely be able to enjoy it for at least several more years. It was not a difficult read for Amber, yet she said it was comparable to most other books written to her age group. She read the book on her iPad using the Kindle app and completed the 156 page book in approximately 2 hours. The first book in the series, The Pilgrim Adventure, sees the main characters, twins named Finn & Ginny, back in time at the Mayflower. They are searching for their parents who have become lost in time. However, their time machine will eventually send them home, so they travel through American history on borrowed time searching for their lost parents. 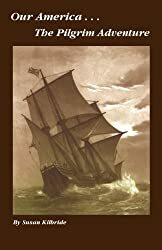 The Pilgrim Adventure weaves accurate historical facts through a fictional story with mystery elements. Amber says the book was intriguing and she so loved the mix of fictional story and factual information. It was interesting enough to keep Amber's attention, but not so long and overly detailed to lose her interest. Although each installment in the Our America series could be read as a stand alone book, Amber feels most readers will want to select The Pilgrim Adventure first in order to better understand the characters. Despite having studied the pilgrims several times in the past and currently studying them again, Amber discovered The Pilgrim Adventure to include numerous details and smaller events in the pilgrims' lives which she had not read in any other book. She found it refreshing to see a new perspective on the pilgrim existence, while the hint of mystery over the twins' parents kept the fictional aspect of the story going well. Although I did not personally read the book, I know most of plot intricacies due to Amber's enthusiastic descriptions. Each book in the series also has a free PDF of hands-on activities related to the time period available at the Funtastic Unit Studies website. We enjoyed working on the family tree project from The Pilgrim Adventure activities and I finally learned how to play Quoits. The activities are all fun and appropriate for the target age of the books. The Pilgrim Adventure is a great start to what we hope is an equally intriguing series. After finishing the book, Amber immediately asked for the rest of the series. She said it reminds her of a grown-up style Magic Tree House book. We all lamented the day when it became clear she was too old for the Magic Tree House series, so of course I will be downloading the rest of the Our America series shortly. My daughter adores this series!